When astronauts return to the Moon in the years ahead, they might encounter electrified fountains and other strange things. March 30, 2005: It's astounding how prophetic some science fiction has been. "â€ŚThe [Moon's] surface material is one of the lousiest imaginable electrical conductors, so the dust normally on the surface picks up and keeps a charge. And what, dear student, happens to particles carrying like electrical charges?" "They are repelled from each other." "Head of the class. And if a hundred-kilometer circle with a rim a couple of [kilometers] high is charged all over, what happens to the dust lying on it?" The answer, given only by narrative description, is that electrostatic charging caused the dust to levitate. Well, guess what? Writer Clement was righter than he knew. It appears lunar dust does levitate above the Moon's surface because of electrostatic charging. And the first evidence came almost the way Clement had described. In the early 1960s before Apollo 11, several early Surveyor spacecraft that soft-landed on the Moon returned photographs showing an unmistakable twilight glow low over the lunar horizon persisting after the sun had set. Moreover, the distant horizon between land and sky did not look razor-sharp, as would have been expected in a vacuum where there was no atmospheric haze. 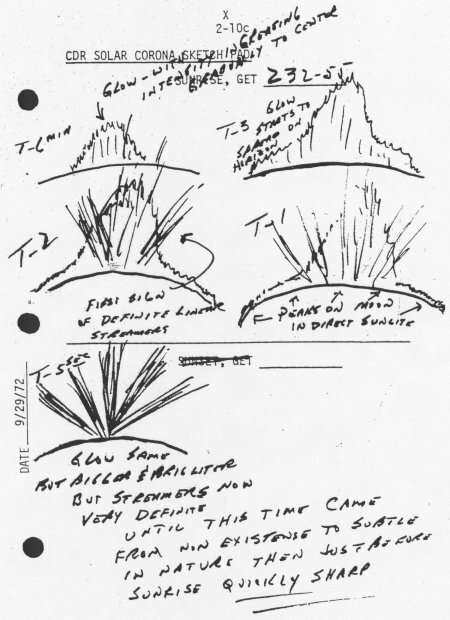 But most amazing of all, Apollo 17 astronauts orbiting the Moon in 1972 repeatedly saw and sketched what they variously called "bands," "streamers" or "twilight rays" for about 10 seconds before lunar sunrise or lunar sunset. Such rays were also reported by astronauts aboard Apollo 8, 10, and 15. Here on Earth we see something similar: crepuscular rays. These are shafts of light and shadow cast by mountain ridges at sunrise or sunset. We see the shafts when they pass through dusty air. Perhaps the Moon's "twilight rays" are caused, likewise, by mountain shadows passing through levitating moondust. Many planetary scientists in the 1970s thought so, and some of them wrote papers to that effect (see the "more information" box at the end of this story for references). But without an atmosphere, how could dust hover far above the Moon's surface? Even if temporarily kicked up by, say, a meteorite impact, wouldn't dust particles rapidly settle back onto the ground? Well, no--at least not according to the "dynamic fountain model" for lunar dust recently proposed by Timothy J. Stubbs, Richard R. Vondrak, and William M. Farrell of the Laboratory for Extraterrestrial Physics at NASA's Goddard Space Flight Center. "The Moon seems to have a tenuous atmosphere of moving dust particles," Stubbs explains. "We use the word 'fountain' to evoke the idea of a drinking fountain: the arc of water coming out of the spout looks static, but we know the water molecules are in motion." In the same way, individual bits of moondust are constantly leaping up from and falling back to the Moon's surface, giving rise to a "dust atmosphere" that looks static but is composed of dust particles in constant motion. You can get some hands-on experience with the fountain model ... on top of your head. Rub an inflated balloon on your hair, and then hold the balloon a few inches away. Your hair will rise of its own accord to reach out toward the balloon. Rubbing the balloon removes some of the electrons from your hair, leaving your hair with a net positive charge. Your positively charged hair is attracted to the negatively charged balloon. Now watch what happens when you hold the balloon far away. This is key: Your individual hairs spread out from one another and do not immediately fall back to lie flat on your head. What's happened? When the balloon was removed, each positively charged hair repels its positively charged neighbor and some of your hair remains suspended--just like dust on the Moon. On the Moon, there is no rubbing. The dust is electrostatically charged by the Sun in two different ways: by sunlight itself and by charged particles flowing out from the Sun (the solar wind). On the daylit side of the Moon, solar ultraviolet and X-ray radiation is so energetic that it knocks electrons out of atoms and molecules in the lunar soil. Positive charges build up until the tiniest particles of lunar dust (measuring 1 micron and smaller) are repelled from the surface and lofted anywhere from meters to kilometers high, with the smallest particles reaching the highest altitudes, Stubbs explains. Eventually they fall back toward the surface where the process is repeated over and over again. Above: A sketch of the moondust-fountain model from "A Dynamic Fountain Model for Lunar Dust" by Timothy J. Stubbs, Richard R. Vondrak, and William M. Farrell. If that's what happens on the day side of the Moon, the natural question then becomes, what happens on the night side? The dust there, Stubbs believes, is negatively charged. This charge comes from electrons in the solar wind, which flows around the Moon onto the night side. Indeed, the fountain model suggests that the night side would charge up to higher voltages than the day side, possibly launching dust particles to higher velocities and altitudes. Day side: positive. Night side: negative. What, then, happens at the Moon's terminator--the moving line of sunrise or sunset between day and night? There could be "significant horizontal electric fields forming between the day and night areas, so there might be horizontal dust transport," Stubbs speculates. "Dust would get sucked across the terminator sideways." Because the biggest flows would involve microscopic particles too small to see with the naked eye, an astronaut would not notice dust speeding past. Still, if he or she were on the Moon's dark side alert for lunar sunrise, the astronaut "might see a weird, shifting glow extending along the horizon, almost like a dancing curtain of light." Such a display might resemble pale auroras on Earth. Stubbs and his colleagues are now hard at work on a host of fascinating questions. For example, there are deep craters at the lunar poles that never see sunlight. Would these craters have a strong surplus of negative charge? Astronauts need to know, because in the years ahead NASA plans to send people back to the Moon, and deep dark craters are places where they might find pockets of frozen water--a crucial resource for any colony. Will they also encounter swarms of electric dust? 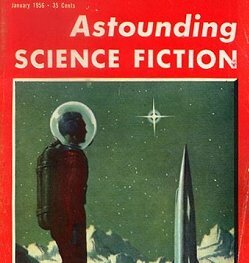 It's not science fiction any more.